Check our Facebook events page for additional opportunities. Bring a friend and the whole family each Saturday for a refreshing workout that will keep LOU on the move. Want to achieve a higher quality of life? If you live a highly stressful, drama ridden life, come to one, two, or all of these workshops. ActiveHealth will conduct a workshop with varying topics the 1st Tuesday of every month. Topics include healthy eating, stress relief, diabetes, and stretching. When a person’s wellness is heightened, so too is their ability to be productive in all phases of their life: home, work, relationships, etc. Find the 2016 schedule below. All Transformation Tuesday workshops will be held from 3:45 PM to 5:00 PM in the Insight Park 1st Floor Seminar Room (East). Learn how to eat right for life by visiting RebelWell’s Registered Dietitian. Registered Dietitians are food and nutrition experts and RebelWell covers up to five (5) free visits for all UM faculty, staff, and students who participate in RebelWell sponsored programs. Take advantage of your Nutrition Counseling benefit by calling (662) 915-2081 or email maanaya@olemiss.edu to schedule your free appointment. 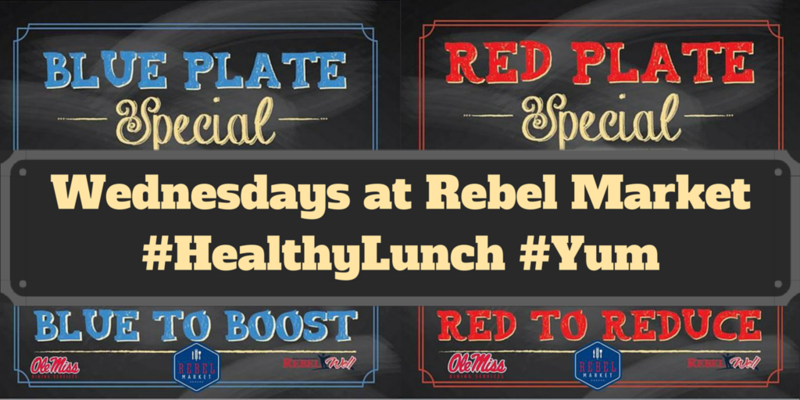 RebelWell and Ole Miss Dining have partnered to highlight the delicious, nutritious and healthy food options around campus. 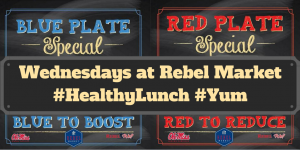 Each week, we will highlight a ‘Red Plate’ and a ‘Blue Plate’ where we show and tell about an accessible meal option that is 500 calories or less and one that is a bit higher than 500 calories (but not more than 700 calories) for those who require a little more fuel. RED to REDUCE! BLUE to BOOST! RED is for those who are trying to reduce your calorie intake. BLUE is for those who are more active and require more calories. Follow us on Facebook and Twitter to see the weekly red and blue plates. Learn how to stock your pantry, cook with healthier fats, use seasonings, understand components of a healthy breakfast and how to substitute healthier ingredients in y our favorite recipes. ~ Learn tips for preparing meals quickly ~ Enjoy a food tasting at the end of each talk. Fall 2016 schedule coming soon! These free events are limited to 35 guests. 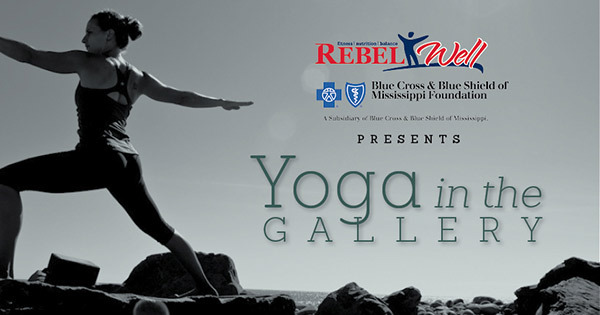 Please register online at http://www.olemiss.edu/hr/rebelwell.html to reserve your seat. Join others virtually for monthly Webinars discussing various wellness topics. Registration required. Webinars are held the 2nd Tuesday of each month with two options to participate: 9:30am and 1:30pm. Introducing a pilot program for departmental bikes and adult trikes. Aside from walking, bicycles are a healthier way to move about the campus. So hang up the golf cart keys and hop on a bike to get to your next meeting or make a delivery. The bike order arrived January 2015 and the adult trikes were distributed the week of December 15th 2014. The quantity of bikes/trikes is limited as we pilot the program, but don’t give up. We hope to continue adding to our fleet. If you are interested in obtaining a bike for your department or have questions, please contact Andrea Jekabsons at (662) 915-1530 or andreamj@olemiss.edu. 2016 Dates and Details Coming Soon! FREE and open to the public. Tastings will be provided. Let the nutrition experts on campus give you a guided walking tour of healthy dining opportunities on campus. (Most) Tuesdays at 12:30 during the fall and spring semester (weather permitting.) 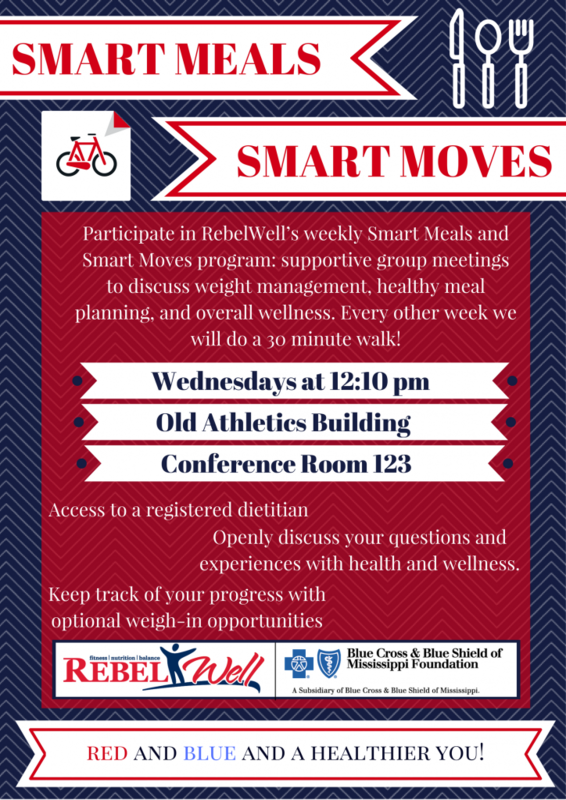 Spend 30 minutes walking the beautiful Ole Miss campus while nutrition experts provide information about healthy dining options. Tour begins at Lenoir Hall and ends at Einstein Brothers Bagels in Anderson Hall. Tours are free, but advance registration is required. Please call (662) 915-2081 for additional information and for a complete schedule. Wellness on Wheels are UM’s faculty/staff mini health fairs. Free cholesterol and blood pressure screenings will be offered as well as nutrition information including proper portion size, BMI calculation and overall body strength and flexibility testing. A registered dietitian and fitness experts will be on hand to discuss your results and steps to improve your findings. When you are crunched for time, a 7-10 minute workout using only your own body weight is an effective workout for many. Join us for a short, instructor-led workout and afterward for a juicing demo. If you’ve never tried a ‘green juice’ and wonder what the craze is all about, here’s your chance. While juicing is never recommended as a meal replacement, there are benefits to adding an occasional juice to your diet. Learn how to make delicious, fresh juices and smoothies. Samples will be available. Yoga can revitalize your body and mind with a just a few minutes of gentle stretches. The best part, yoga can be done right at your desk if you are short on time or space. Join us for 20 minutes of ‘desk yoga’ instruction by Emily Blount followed by a complimentary fat-free probiotic frozen yogurt with 2 toppings from freshii (a $4.99 value).